Solid back, polished sterling silver scottish rite ring has a 1/2 carat total weight diamond cluster on top. 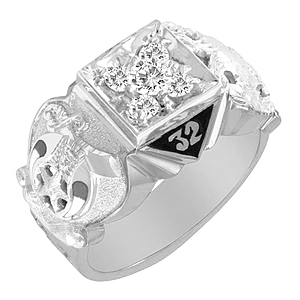 This wide ring features Mystic Shrine side emblems and black enamel 32nd degree accents. Five round brilliant diamonds. Item weighs approximately 16.3 grams. This item is handcrafted in the USA.